I'm really grateful to Leanne Moden for nominating me for the Liebster Blog Award this week! Congratulations to Leanne for her nomination too! The award recognises bloggers whose sites have less than 200 followers, and it's a great way for bloggers to show their appreciation for their fellow writers. As part of the process, nominated bloggers must give 11 facts about themselves, and answer the 11 questions posed by the person who nominated them. Here goes! 1. I am a bit of an odd-job artist - I do illustration, graphics, painting (both digital and physical), photography, set design & building, prop making and scenic painting - phew! 2. I live in London but grew up in North Yorkshire - I love going back to my parents' and enjoying the fresh clean air, the green, and the quiet! 3. I love food and I make amazing curries and bolognese! 5. I love wearing bright colours and when I was recently told to wear black for work I struggled to find a full outfit in my wardrobe. I settled for a black and white polka-dot dress. 6. I wish I could earn enough money just from art to be able to focus on it. Unfortunately I have to have a day job moving boxes around. 8. I love the smell after rain - but only in the country or the park. 9. I love science and history - apart from art they were my favourite subjects at school. 10. I almost never wear makeup as I have very sensitive skin. I also don't use soap on my face for the same reason! 11. I'm not a real ginger (gasp) - Although I was born a redhead, it turned blonde, and I now use Henna to dye it. I'm ashamed to admit it, but mainly as self-promotion! I use my blog instead as a website as a sort of more in-depth portfolio of work. I like the way you can use tagging to organise and link things, and it's useful to be able to have links at the top directing my visitors to things such as a more linear gallery, and projects like my Dad's book. Just about everything - I read a lot, so I always want to be drawing the characters in the books I'm reading (but mostly never get around to it). I also love walking and looking at things, and I watch a lot of films. I find Pintrest really useful to quickly document any images that I find interesting or inspiring. 3. What advice would you give your sixteen-year-old self? Don't stress too much, don't feel guilty about taking a break, don't be surprised when your life doesn't quite go as planned, and keep in touch with friends! Oh - and practice saying 'No'! 4. What's the nicest thing anyone has ever said about your work? Nothing really stands out that I can remember at the moment, but I get a lot of 'how do you do that??' comments. 5. What's the worst criticism you've ever received? Did it spur you on to better things? I try to take criticism as constructive, and use it to improve my work. Most of the commissions I've taken on require a certain amount of criticism so that I can actually get what the client wants - as usually they don't really know until they see it! I'm more likely to get frustrated if I send an image, and then the client takes ages to get back to me with feedback, because that's wasting my time waiting for a response; especially if the deadline is tight. 6. Art, music, poetry - why are these things important? 7. What would you like to be doing in five years time? I would like to be at the point where I am earning money from being creative rather than boring jobs I've had to take to make ends meet. It changes depending on my mood - at the moment I'm working on a digital painting that has a moody sea in, so I'm liking dusky blues and greens and greys. Clothes-wise - I really like dark red/burgundy, and purple. 9. When is a door not a door? 10. What was the worst job you ever had, and what did you learn from it? I've had quite a lot of worst jobs. However I think Uniqlo gets the grand prize for absolute lack of respect for the staff, and military-like rules, and rude uncaring management. 11. Who would win in a fight: a bear or a lion? The idea of the Liebster Blog Award is to show your appreciation for great bloggers and learn more about them in the process. It's also a fantastic way of getting some online exposure for your own blog, and for the blogs of people that you admire! What's not to like? 4. What's the most important thing anyone has ever said about your work? 8. What is your favourite thing in the world? 11. If you could live anywhere - even somewhere that doesn't exist, where would you live, and why? Remember, nominees need to answer all of the 11 questions and write 11 fun facts about themselves. 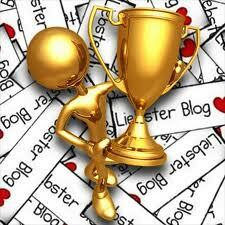 Then choose 11 nominees to receive the Liebster Blog Award and assign them your own 11 questions to answer. It's that simple! Christina at A Sense Sublime, Justine at Justine Howlett Illustration, Naomi at Naomi Winters, Vincent at Quest for Animation Glory, Laura at Random Scribblings, Hannah at Hannah Radenkova: Illustrator, Samantha at Geeky Sweetheart, Laura at Laura Mossop Portraits, Helen at A Little Bit Askew, Tom at London Particulars, and Naomi again at Abandon Spoon!